It has been variously called fibrous cement, paper adobe, padobe, fidobe and papercrete. Whatever you want to call it, papercrete is an amazing, low-cost alternative to wood or cement construction. Summer in the Baja and especially in San Felipe makes one inclined to believe urban legends about spontaneous human combustion. It gets hot here. So hot you can't open your car door or grab your steering wheel with your bare hands. And God help you if you are wearing shorts and absent-mindedly stradle a motorcycle with a black vinyl seat. You get the idea. The climate begs a home building technique that lends itself to desert living. But strangely, most people here build with cement block. This seemed to me slightly deranged, not to say fevered. So I began searching the internet for alternatives. And found papercrete, specifically, Sean Sands' wonderful dome creation. I immediately set about to build a tow-mixer. 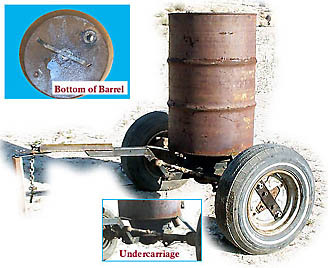 At a junkyard, I picked up the rear end of a small car for $20 and a 55 gallon drum for $8. The assembly, welding and painting of the mixer took a few unhurried days. At the same time, I built a large chickenwire and wood enclosure for the collection of paper products. Pretty soon, through the generosity of neighbors who saw the advantage of keeping their trash volume to a minimum, I had enough for a 55 gallon test load. I presoaked the paper in 55 gallon barrels overnight and fished the soggy paper out with a rake and dumped it into the mixer. I also built a sand screening device and screened a pile of the local ground sand. I made block forms from 12 foot lengths of 2x6's, rabbeting grooves to slide 1/2 inch ply partitions every 16 inches. Then I welded up rebar staples to slide over the forms walls to prevent spreading. I made a rectangular press from 3/4 inch plywood, a plate of steel with a pipe handle welded to it. I drilled a series of holes through the form walls to allow water to escape. I also made a drain tray from a sheet of corrugated steel placed under a screen mesh and held inside a wood frame. Two short legs were fixed to one end to pitch the drain so water would run out. The first batched turned out fine. Towing the mixer a short distance made it plain a lid was needed to prevent the mixture from jetting out of the barrel. It took a surprisingly short time to reduce the pulpy paper into a slurry of greenish brown porridge. The large ball valve I put on the bottom didn't work properly. The recess filled with big lumps which couldn't pass through. I eventually settled on unhitching the mixer and tilting it onto the lip of the drain tray, rather gingerly because of the weight. But this worked well, although I had to put on rubber gloves and hand-shovel the remaining mess out. A fair amount of water drained off the tray. I then shoveled the slurry into the form pockets then squeezed more water out with the plywood press, jumping up and down and rocking it back and forth. The climate here is quite dry most of the year. It was only a matter of hours before the staples could be pulled and the form walls knocked free. Later, I had the idea of searching out construction sites and asking the crews to save their empty cement bags. I would drive to several sites on a Saturday and fill the pickup. These bags were great for making bricks as they already contained a certain amount of cement powder in them. And there seemed to be an almost endless supply as the construction industry in the area was booming. The next experiment was with sand bags and papercrete. 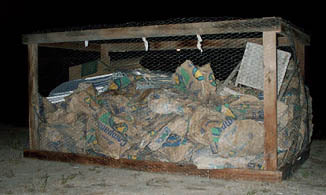 I brick-layered a six foot high wired-together sandbag base, wrapped with chicken wire. Then I mixed papercrete and trowled it on by hand. The base turned out fine and held a ton of water with no problem. I am now going to build a 250 gallon mixer and try to pour or pump the papercrete into forms for monolithic walls. Recently I welded up a few wireframe 'hives' with open front and a little tilted visor. 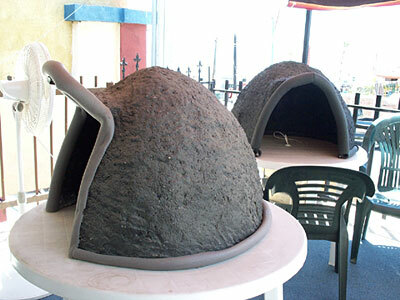 I covered with with papercrete with a slightly higher cement content and sprayed it black. I am using it as a laptop shade on a sundeck. You can take a peek at it HERE.